The price of precious metals is pushing Indian 2.5 dollar gold coin values higher. Your coin is worth a minimum of $214 for a common date in worn condition. At the top end of the scale is the 1911-D, the rarest date, this old US gold coins value is over $2,266 in "Circulated" condition. With just one rare date in the series, the condition of your coin is key to value. The less wear evident, the more appealing to collectors and dealers. The coin pictured, an "Uncirculated" Indian 2.5 dollar gold piece, is worth $297 or more because of its rare state of preservation. It shows no visible wear, nice luster, and few abrasions. With higher condition coins worth so much more it is important to judge your coins carefully. "Grading" gold coins is covered in more detail below. By recognizing a better condition coin, you have discovered higher Indian 2.5 dollar gold coin values. Understand all Indian gold is scarce, and all are collectible. The chart highlights the most sought after coins are ones in the "Uncirculated" grade. Even if your coin shows some wear, it is still very desirable to a collector. However do expect variations in value to occur subject to subtle grading points, collector demands and dealer needs. For more background information, see how value listings in the Coin Value Guide are determined. Grading gold coins involves judging the different stages of wear as a coin goes from "brand new" to very worn. Each stage is assigned a "Grade." 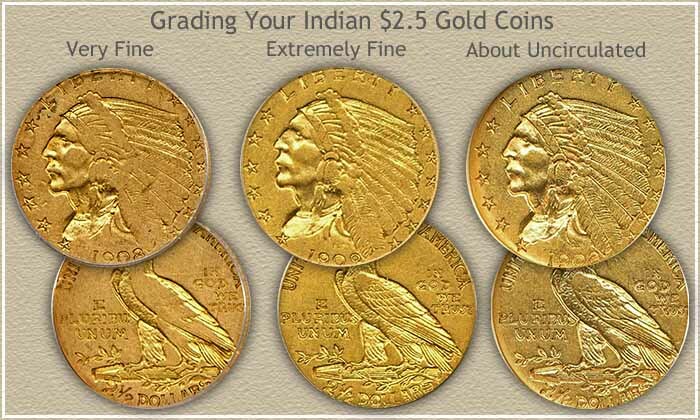 Indian 2.5 dollar gold coin values depend on careful attention to these details. The "uncirculated" coin it bright and lustrous with no wear. Examine the headdress for signs of broken luster. If there is the slightest wear on the headdress the coin is "About Uncirculated" a lower grade. An Indian $2.5 with light wear on the headdress and no remaining luster is in "Extremely Fine" condition. As the details of the ribbon and feathers wear away, the coin slips into the "Very Fine" grade. Use the above grading image to help understand the different stages of wear. But only as a guide to approximate values. Especially true if you feel your coin is Uncirculated. At that level very subtle elements affect grading decisions. There is always the potential for increased Indian 2.5 dollar gold coin values. Investigate and see the market in action, check a few rare coin dealers listings, look for those offering $2.5 gold coins similar to yours. Their listings and prices include a notation of the NGC or PCGS assigned grade. Additionally, these coin dealers are potential buyers of your coins. Two mints produced Indian $2.5 gold coins. The Denver mint in Colorado, placing a "D" mintmark on their coins, and responsible for the rare 1911-D. And the Philadelphia mint, it did not use a mintmark. 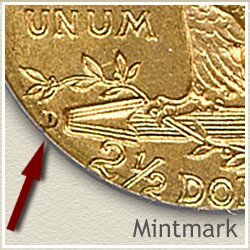 Locate the mintmark on the reverse, along the edge, just to the left of the eagle. A magnifying glass is often necessary to detect the mintmark, sometimes weakly struck and prone to wear. Many gold coins are rare for their date and type. All are scarce. The Indian $2.5 gold coin with its Incuse design is particularly fascinating to collectors. The rarity of well preserved coins is the reason they are at the top of every dealer and collector want list. Indian 2.5 dollar gold coin values are solid, and the current trend is up. Enjoy them, store them safely, and handle gently by the edges to preserve their value. Never clean any coin for any reason. Find the value of all your gold coins. From the one dollar piece to the huge twenty dollar coin. Discover the rare dates and mints. 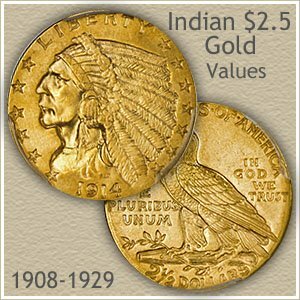 Print the Coin Values Worksheet - link in navigation column - to list your Indian $2.5 gold coins and record their values. Should you decide to sell... use the worksheet as an invoice and packing slip when sending coins through the mail to dealers. Or carry it with you when visiting dealers.